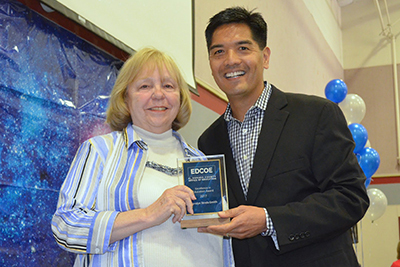 Each year, the El Dorado County Office of Education (EDCOE) recognizes individuals for hard work that directly or indirectly contributes to providing quality support and services to students, schools, families, and the community. One admirable team member is selected to receive the Superintendent’s “Excellence in Education Award”; this year’s recipient is Carolyn Strelo-Smith - a retiring teacher at the Rite of Passage, Sierra Sage Academy in Yerington, Nevada. EDCOE serves as the Authorizer and Governing Board for the Rite of Passage Charter High Schools providing all administrative, instructional, and financial support for the educational and vocational training programs for incarcerated students. Along with Carolyn’s passion for her students, she is deeply committed to the betterment of her community. At age 21, she became the campaign manager for Edwards for Congress in Newark. Her campaign work continued for several election years, including fulfilling the role of Political Chair of the Alameda County Teachers from 1967 to 1969. She was named Citizen of the Year by the Lions Club in 2003 and currently serves as the Director of the Rotary Club of Yerington, Director of Through a Child’s Eyes, and a hospital board member. On a personal note, Carolyn loves quilting. As part of project-based learning curriculum, she taught the students how to make their own and compiled their individual pieces to make a school quilt. As part of Rotary, Carolyn ensured that a Silver State or Sierra Sage Academy student may be named as a student of the month and makes arrangements for these students to attend the meeting to be properly recognized.